Calleguas and its contractor will take all feasible steps to minimize construction impacts on the public. This page is offered to advise the public of the current status of projects that are in progress. Please check often for updates. If you have any questions about construction in your area that are not answered in the information below please contact 805.579.7128. The Calleguas Salinity Management Project (SMP) is a regional pipeline that will collect salty water generated by groundwater desalting facilities and excess recycled water and convey that water for re-use. Any unused salty water will be safely discharged to the ocean, where natural salt levels are much higher. The construction of the Grandsen Pump Station, Phase 2 Project will include the addition of two pumps to the existing completment of three pumps originally constructed in 2009 at this existing site. Other work will also be completed at the site to facilitate delivery of water throughout Calleguas' service area. Construction of Phase 2 is underway and is expected to be completed by later 2018. The construction of the Wellfield Emergency Generators will primarily occur at Wellfield No. 2 (with some work at Wellfield No. 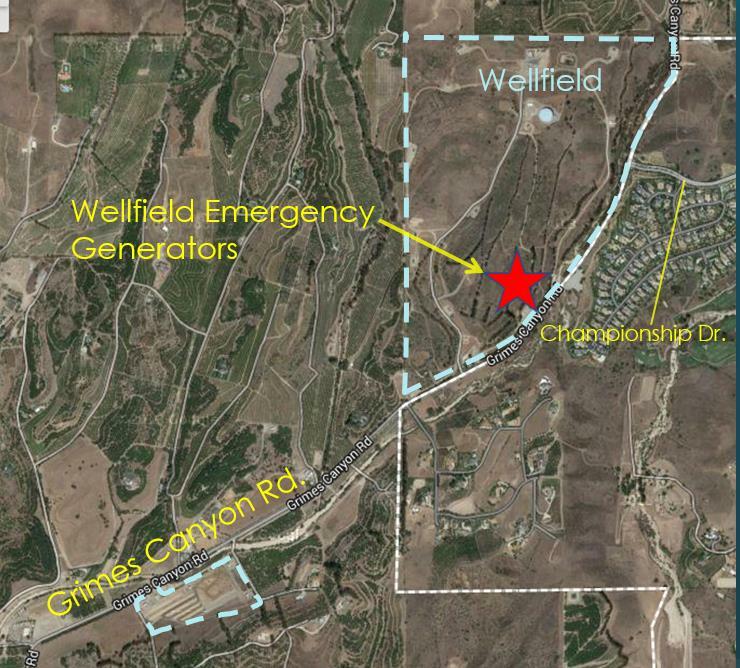 1 and along Grimes Canyon Road) and will include five diesel backup generators housed in a building, a fuel storage area, and an equipment yard for new electrical service to the wellfield. Other work will also be completed at the wellfields to support the new facilities. The Las Posas Basin Deep Groundwater Monitoring Project, Monitoring Well No. 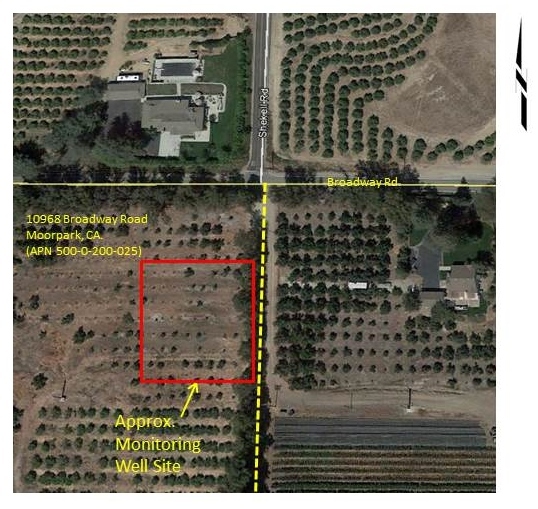 2, will be constructed at 10968 Broadway Road in Moorpark, as shown on the map, at left. Calleguas secured permission from the underlying property owner to construct the monitoring well here. The new monitoring well will facilitate collection of groundwater elevation and water quality data to enhance on-going monitoring of wellfield operations at Calleguas' existing Las Posas Basin Aquifer Storage and Recovery (ASR) Wellfield facility, which is located south of this property at 6811 Grimes Canyon Road in Moorpark. The ASR project is used to store imported water in the aquifer for later use during outages of Calleguas' imported water supply. The Monitoring Well will not be used to pump groundwater for purposes other than water quality sampling. 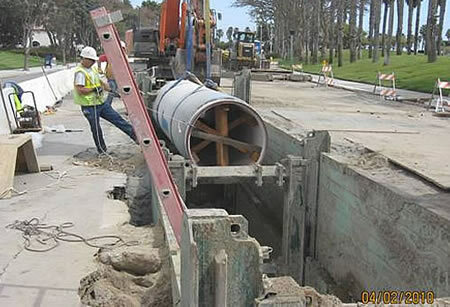 In an effort to better prepare for emergencies, Calleguas Municipal Water District (Calleguas), in collaboration with Crestview Mutual Water Company (Crestview), is diversifying its water resources by constructing a connection to Crestview's water system. This important project will provide an additional water source allowing Calleguas to continue serving its customers during periods when imported water is not available, without affecting deliveries to Crestview's customers. The project consists primarily of an underground vault in a vacant lot along Via Zamora, next to Springville Park and a pipeline through and adjacent to the parking lot of the park. Construction is expected to be completed in Summer 2019.